Tropical Storm Colin Update: What Should Motorists Do If Stranded in a Flood? Usually, motorists can avoid driving in flooded roadways by following flood watch warnings. But in the case of extreme storms like Tropical Storm Colin, which has caused extensive flooding around here in the St. Petersburg area this week, sometimes flash flooding occurs before residents are able to leave work or school. Authorities have already performed a water rescue for a motorist stranded in Pinellas County on Tuesday. It’s never advisable to drive during a flood, but for those who end up caught in flooded roadways, it’s essential to know what to do and how to escape for safe ground, as nearly half of all flash-flood fatalities are vehicle-related. Drivers often overestimate their ability to navigate through flooded roads, thinking the water is a lot shallower than it actually is. 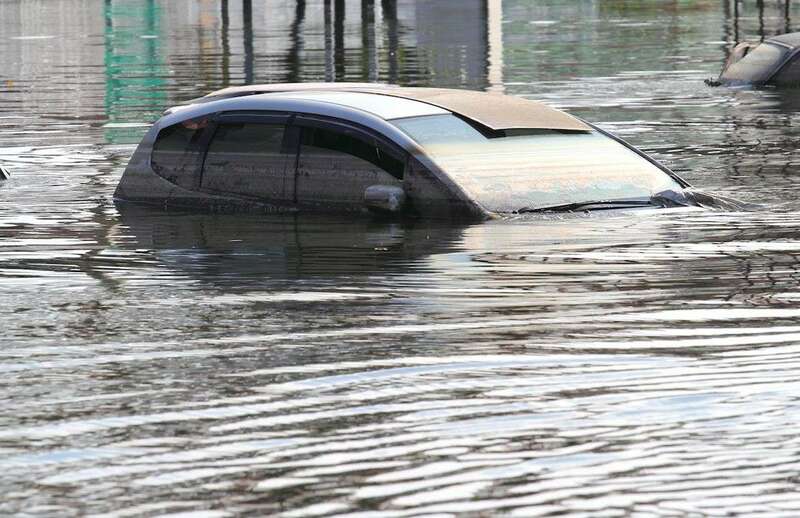 The thing is motorists can lose control of their vehicle in just six inches of water, as there is no friction force once a vehicle is lifted off the road. At this point, a vehicle can easily be swept downstream into deeper bodies of water and sink. Passengers can drown if they’re not prepared to quickly escape the car at this point. That’s why it’s advisable that motorists who must drive during heavy rains should turn around and avoid navigating flooded roads in the first place. This is the focal point of the National Weather Service’s “Turn Around Don’t Drown” campaign. All car owners in Florida should keep a safety kit for dealing with flooded roads during hurricane and tropical storm season, especially those in the Tampa Bay area. This kit should contain a flashlight, a special hammer for breaking vehicle windows, flares, non-perishable food, clean water, and a cellphone for calling 911. Don’t panic, but prepare to leave your vehicle as quickly as possible, according to NWS. If the water is below the bottom of the car’s door, simply unbuckle your seatbelt, open the door, and safely evacuate your vehicle. However, if the water level is higher than the bottom of your car’s door, do not open the door, or else your car will flood. If you can roll down the windows and escape through them, do so. If not, safely break the glass of your vehicle windows, preferably with an emergency hammer, to reduce harmful glass shattering. If you’re on stable, higher ground, but your car isn’t, call 911. Signal for help with a flare, if you have one, and be wary of debris and potentially contaminated sewage water as you evacuate, according to authorities. It’s important for residents to be up-to-date with emergency alerts from Pinellas County, but it’s not always possible to anticipate flash flooding as a result of tropical storms, like in the case of Colin. If you are unable to leave work or school before a tropical storm makes landfall, be sure to know what to do if you are forced to drive through dangerous flooded roadways to avoid a disaster. St. Petersburg residents should also be aware of all Tropical Storm Colin updates this week. On Tuesday, the mayor of St. Pete Beach warned residents against using their showers, dishwashers, and washing machines, as the sewer system is backed up.